Water kefir, also sometimes called tibicos or ‘water crystals’, is a drink made from a culture of bacteria and yeast that are contained in a ‘polysaccharide biofilm matrix’. This might not sound delicious (indeed it may sound positively evil… ), but actually this is a very common drink in a number of countries and one that is much like carbonated soda drinks (slightly less sweet) but with added health benefits – that being the healthy probiotic nature of the bacteria which can aid digestion and other gut-health as well as the high content of enzymes, micronutrients and more. It’s also dairy free so it’s ideal for vegans as a way to get their probiotics. Read on and we’ll look at how you can make some yourself. Kefir works with sugary liquids using the sugar as fuel to create lactic acid, alcohol and carbon dioxide which is how the drink is carbonated. The precise mixture used in the concoction varies between cultures, and the mix of yeast used varies from lactobacillus to streptococcus to pediococcus and others. 1. First of all you should drop the sugar into the water and allow it to dissolve. Don’t use honey as this can damage the kefir. 2. Next add the grains to your sugar and water. 3. Optionally add a squeeze of lemon juice. 4. Optionally add a slice of ginger. 5. Allow the concoction to brew in a sealed jar at room temperature – leave for at least 24 hours. The longer you leave it the stronger it will be. Note that the temperature of the room will also affect the speed that it brews. You may take a couple of attempts to get it just how you like it. 6. 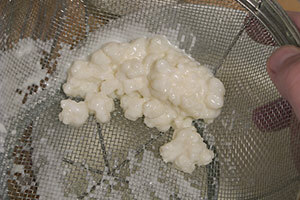 Strain the raisins and the ginger from the water and bottle your kefir. 7. Leave the bottles for yet another 24-48 hours to ferment and to become carbonated. 8. Now serve cold with some ice and impress your friends with a cultural and very healthy drink that’s the perfect alternative to soda (note that it’s still high in sugar though, so don’t overdo it!). Is Your Water Making You Sick Slowly? Is SPF 100 Sunscreen Twice as Good as SPF 50?